Update 4/5/17: Today, Emirates released a video showing the gate-side electronics checking and claim process — which is much better than what I was able to shoot with my cellphone. See the video embedded below. In case you missed it, there’s now a large carry-on electronics ban impacting flights from 10 Middle Eastern and African airports. To recap, no US-based airlines operate flights on these routes and the nine foreign carriers that are affected had to scramble to put procedures in place by the 96-hour deadline, which ended Saturday morning at 3:00am. To see for ourselves how the new electronics ban would be implemented by different airlines and airports, my wife (and TPG contributor) Katie Genter and I embarked on a last-minute trip to the Middle East. Both of us observed Qatar Airways’ gate-side security and boarding area for US-bound flights before each of us went our separate ways, leaving Doha (DOH) on Saturday and Sunday so we could experience the electronics ban for ourselves on our way back to the US. Starting in DOH, I took a short hop on Qatar Airways to Muscat (MCT), Oman, on Sunday before taking Emirates from MCT through Dubai (DXB) to New York (JFK) on Monday. Katie traveled to Abu Dhabi (AUH) via Etihad on Saturday and stayed overnight before flying from Abu Dhabi (AUH) to Dallas (DFW) on Sunday. Here’s what it was like flying Emirates back to the US on the third day of the electronics ban. Emirates’ version of the regulations went into affect Saturday, March 25, giving the carrier enough time to work out the kinks and come up with a customer-friendly electronics gate-check procedure. 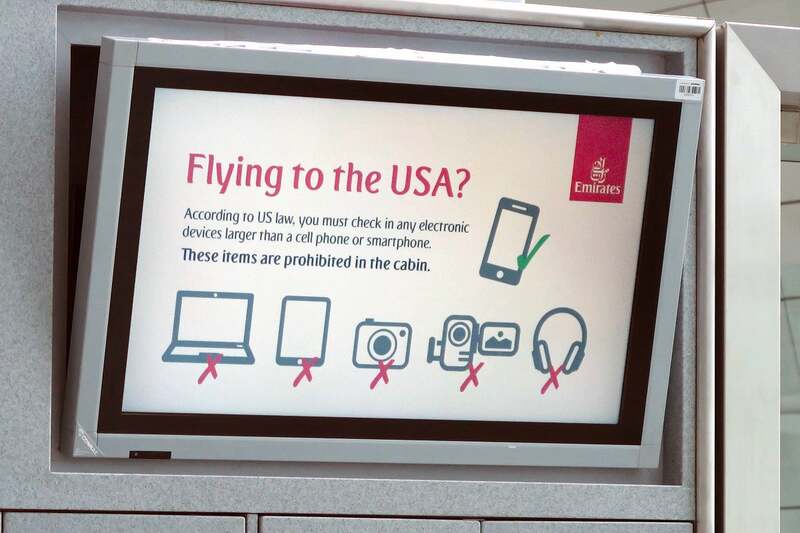 For Emirates, problematic items are defined as “electronic devices larger than a smartphone or exceeding 16 x 9.3 x 1.5cm (height x width x depth)” — excluding medical devices. What About Flights to/from Milan and Athens? I had originally booked my flight to include a layover in Milan (MXP), as initial reports indicated electronics would be banned for all passengers traveling on both the DXB-MXP and MXP-JFK routes. I was expecting to witness some drama in both DXB and MXP when unsuspecting passengers would inevitably be required by the US government to gate-check their devices when they were just flying from the Middle East to Europe or from Europe to the US. As part of Emirates’ announcement about gate-checking electronics, the carrier confirmed that the ban “does not apply to passengers traveling on Emirates’ US-bound flights via Milan and Athens, or Emirates flights to/from any other destination.” But, that still didn’t make it clear whether passengers flying Dubai-Milan-New York would be safe or just those flying Milan-New York. 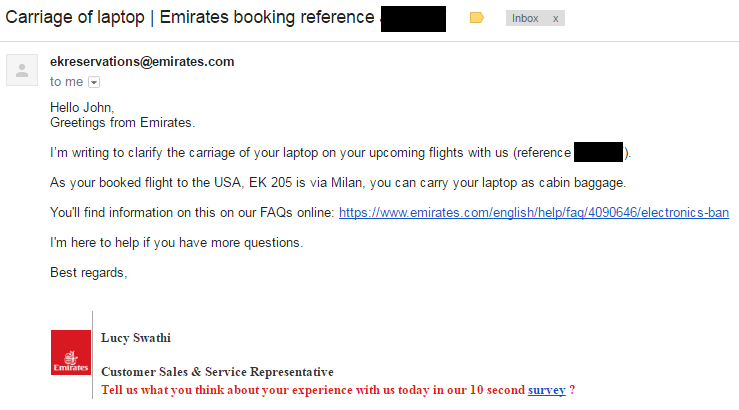 I gave Emirates a call on Friday to find out. B-o-r-i-n-g. Since my mission was to experience the ban firsthand, I changed my flights to go straight from Dubai to JFK. Before leaving the US, I packed an old Chromebook, which I was expecting to sacrifice at the gate for the sake of this story. But as we were traveling, Emirates announced its new gate-check policy, so the Chromebook remained in my checked bag for the return flight and instead, I carried on my good laptop. 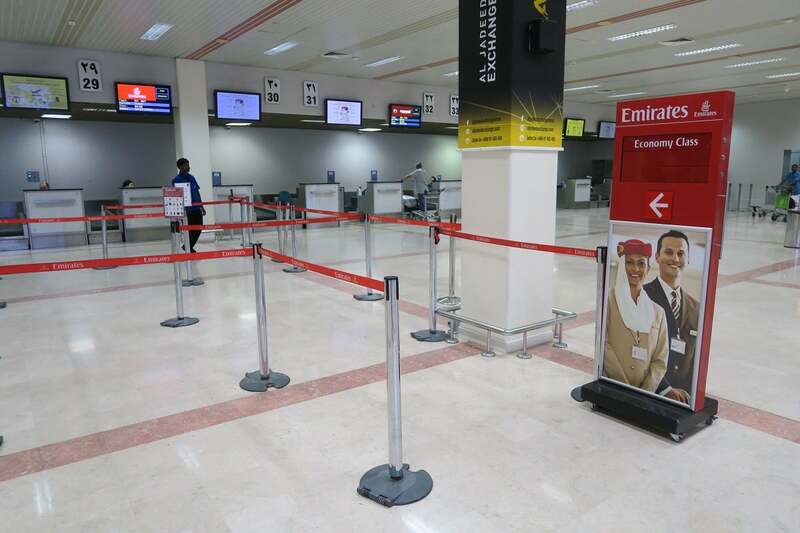 I had specifically chosen to fly out of a non-restricted airport to see what the process would be like at check-in — not surprisingly, there weren’t any signs about the new restrictions at the Emirates desk in MCT. When the agent asked where I was flying, her supervisor’s ears perked up when I mentioned the United States. The supervisor quickly inserted herself into the situation to tell me that I needed to check my camera — which I was holding at the time — as well as any laptops, E-Readers or tablets. When I declared my intentions to gate-check my electronics in DXB after using them during my nine-hour layover there, she informed me that they’d be “taken away” in Dubai and there would be no way for me to get them back — seemingly unaware of Emirates’ latest gate-check policy. I respectfully declined to check my electronics at this time. 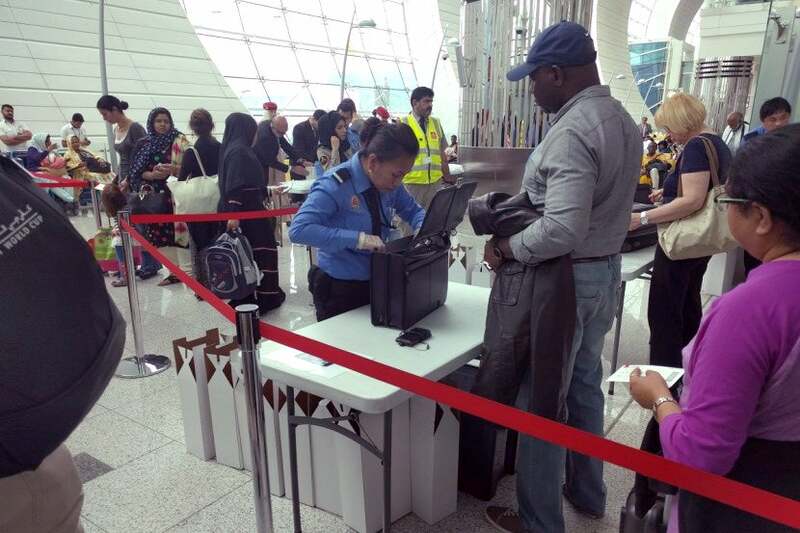 Upon arrival in Dubai, all connecting passengers had to clear transfer security. Laptops had to be removed from carry-on bags, but liquids could remain in your bag and you didn’t have to remove your shoes before passing through the metal detector. 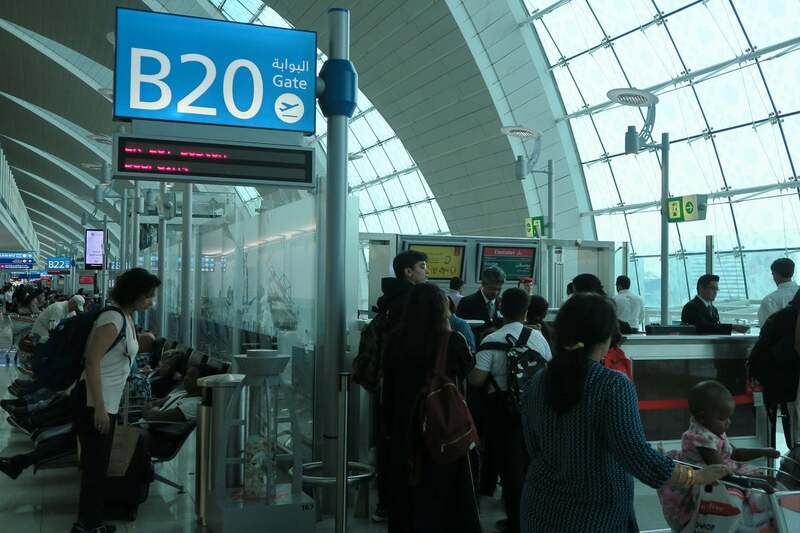 I was hoping to observe a few US departures — as we had done in Doha (DOH) — during my lengthy layover, however all of the departure gates had a boarding pass check system at the terminal level before passengers could enter the area where the secondary checks were being completed. Because of this, I wasn’t able to get an idea of what to expect. I approached one of the boarding pass check agents after a US departure gate had closed and inquired about the situation. Showing her my camera, I asked if I would be able to take it on board. After mentally sizing it up, she said I’d be able to take it on, explaining that it was just the larger cameras that were being restricted. Hi Jason, Ban applies to Bluetooth headphones and any device bigger than cellphone that can be charged on-board. When it was time for my flight, I headed down into the boarding area. There were three lines: one for “SSSS” passengers like me who had been selected for additional screening, the other two for standard travelers, where security agents performed manual inspections of the contents of everyone’s carry-on bags, constantly on the look out for large electronics. The agents even had a handy sizing chart to let them determine the size and clear any electronics. Interestingly, the measurements here were listed in inches even though Emirates had listed the appropriate sizes in centimeters elsewhere. 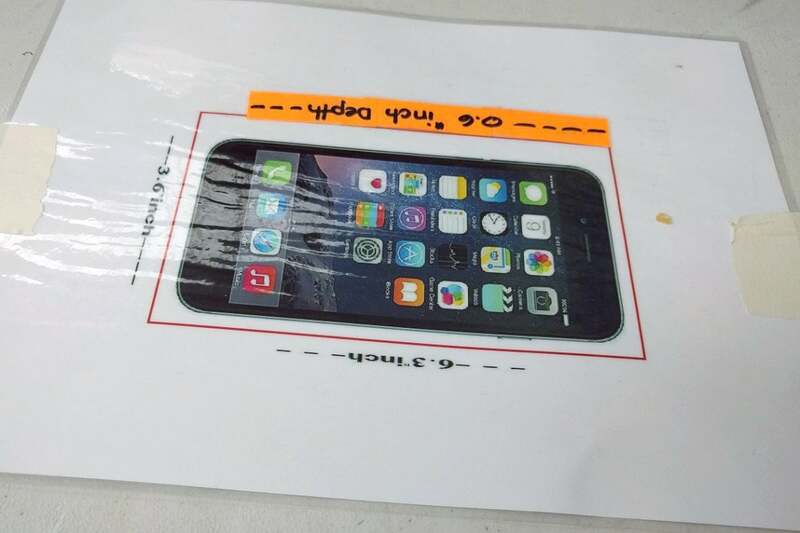 Despite the agents using this cheat sheet, when it was discovered that the passenger in front of me had too large of a cell phone (due to an extended battery pack), he was still allowed to take it on board. 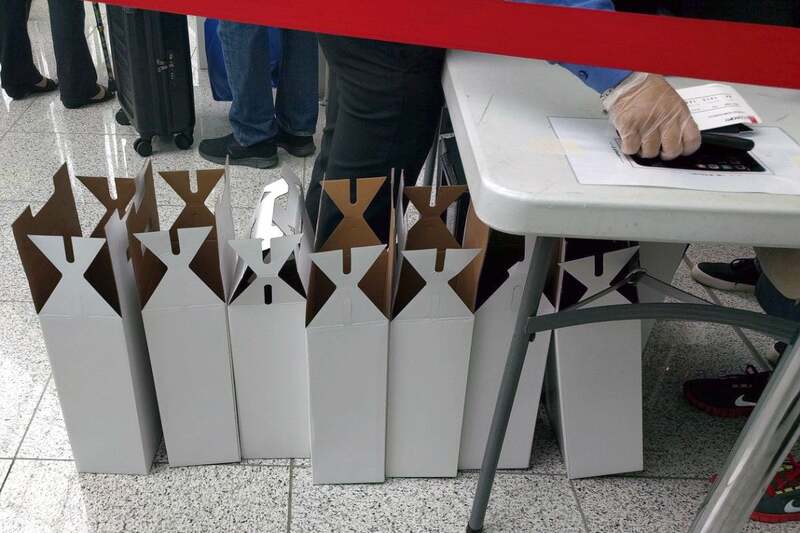 Below, an agent in the standard security line measures a passenger’s phone against the sizer, with boxes available for larger electronics. My hands, shoes (which I got to keep on throughout the screening, by the way), bag and electronics were all swabbed and tested for explosive residue. 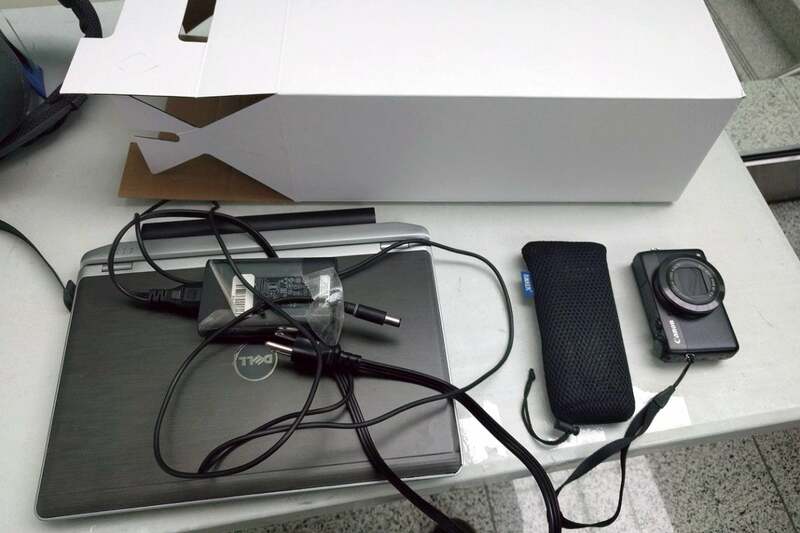 None were found, so I was told to take my laptop and a box to the packing area, where the devices were pulled out once more for a secondary screening. At the packing area, I confirmed with the agent that only my laptop needed to be checked. After looking at my power bank and camera, he agreed so I put them back into my backpack. A few seconds later, a supervisor came over and insisted on checking to see the items I had just put in my bag. After further inspection, he confirmed that I could take the power bank on board, but not the camera. Although I knew it was too large, I protested the final decision on the camera, pointing out that it fit within the size limitations of the agent’s electronics sizer sheet. He stood firm, based on the fact that it was a prohibited item (not because of its size), so I switched tactics, trying to guilt him into it by saying this was my first long-haul flight on Emirates, and I’d hoped to document the experience. Flattered, he still stood firm and expressed his hope that I’d be able to fly Emirates again soon with my camera on board. Decision made, it was time for packaging. On a form (partially visible in the photo below), the agent — who had mistakenly told me that my camera was OK — noted the model numbers of each of my gate-checked electronics. 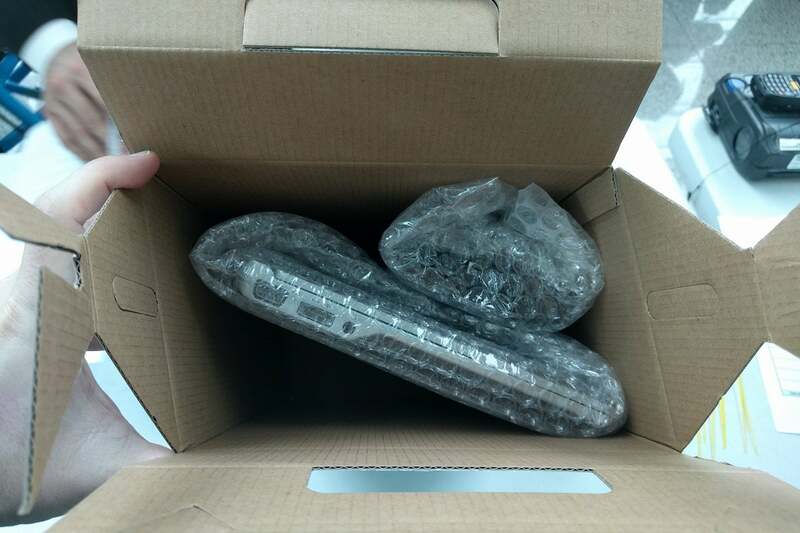 Then, he carefully packed my camera, laptop and charger in bubble wrap. They were then placed in the provided box. Note that my laptop — which has a 12.5″ screen and extended battery — fit snugly in the box, but larger laptops might have more trouble fitting. With my devices safely stowed, the box was closed and sealed with zip ties. A standard checked baggage tag was wrapped around the handle, with a smaller label placed on the form outlining the contents it contained. I was given a claim tag so I could retrieve them later at JFK. We’ll be posting a full economy review soon, but I’ll just note a few quick details from the flight: After boarding was completed and we were waiting to push back, a flight attendant announced that passengers should alert the crew if they had any large electronic devices with them on board, saying that “thorough security checks will be done on arrival” to locate any undeclared items — during the course of the flight, I did see a flight attendant walking through the cabin with a tablet he seemed to have confiscated from one of the passengers. When I asked about it, the FA wouldn’t comment on the situation or give me any details about what kinds of consequences the passenger might face as a result. Upon landing at JFK, I took my time disembarking, knowing that it would take a while for checked bags to come out. 22 minutes later, I arrived at baggage claim after leaving the plane and clearing Global Entry immigration. While checked bags wouldn’t start making it out for another 15 minutes, Emirates already had a table set up near belt 9 with the checked electronics boxes behind it. While the process could be streamlined a bit, it was still very impressive considering it was just three days into the new regulations. First, I was asked to show my claim tag to one of the agents standing by, who would locate your box and take it over to another agent at the table. There, I was asked to present my ID to prove ownership before the agent would cut off the zip ties, remove the bag tag and open the box. 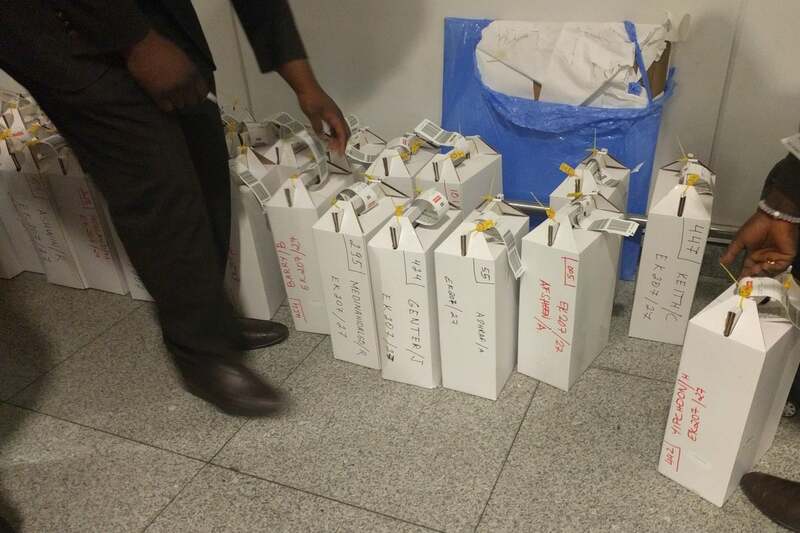 I was impressed by the procedure Emirates has set up to check electronics at the gate in Dubai (DXB) and return them state-side — mine seemed to have suffered no damage from the experience thanks to the thoughtful packing. However, it seems the airline needs to do a better job educating and training its agents in DXB in regard to which items can and cannot be carried on board as it’s concerning that two of them had cleared my technically too-large camera before a supervisor stepped in and forced it to be checked. Have you been on a US-bound Emirates flight since the electronics ban was implemented? Share your experience with us, below.